Second entry in the Riddick film franchise follows the continued adventures of warrior-turned-intergalactic prisoner Richard Riddick. Sequel to Pitch Black (2000). 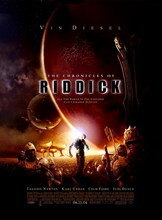 Produced following the surprise success of 2000's Pitch Black and carrying on from the events of that film, The Chronicles of Riddick follows wanted criminal Richard Riddick as he arrives on a planet known as Helion Prime, gripped by a war between the good-guy Furians and nefarious Necromongers. Believing him to be a Furian warrior, Elemental race ambassador Aereon enlists the skilled Riddick to perform battle against the Necromongers, seeing him as capable of stopping them in their quest to "convert" or kill every human in the universe.